Color Classic Web Server News: Running MacHTTP off a RAM disk? I am considering trying to run MacHTTP from a RAM disk to reduce wear and tear on the hard disk of the Color Classic. The drive spins constantly while the machine is on (which is 24/7/365) and while the first drive lasted 15 years it only makes sense to conserve the life of the replacement and reduce the electricity the Color Classic uses if possible. 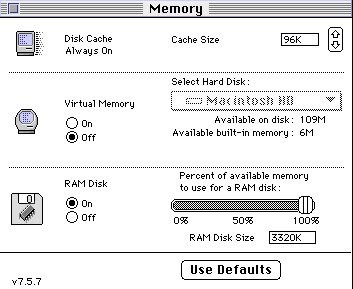 The memory control panel will only let me set a RAM disk for a little over 3MB. Maybe setting the disk cache to higher number will help? I guess I need to review the memory usage concepts from System 7.6.x. I've not found a way to get the hard disk to spin down on the Color Classic despite running MacHTTP off a RAM disk. It looks like this option for power savings may be unique to PowerBooks for Mac OS 7.6.1; the only energy saving option available on the CC is to dim the screen after a specified amount of time.